TAC RECORDS? That's right: Not Tacoma Records, & not Sea-Tac Records. 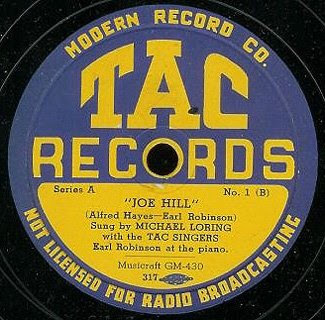 TAC Records was the politically progressive New York-based label that in 1939 issued this 78 rpm disc of Seattle's labor songster, Earl Robinson, & his famous 1936 tribute tune, "Joe Hill." Perhaps the most widely recognized ballad penned by Robinson (& the lyricist/poet, Alfred Hayes), this song saluted the life of America's labor activist/martyr, Joe Hill, who was infamously executed by the State of Utah on November 19, 1915. This early rendition – one of many cut over the following seven decades (including Joan Baez's high-profile 1969 version at Woodstock) – is notable for featuring Robinson's own piano-work behind the vocals of lefty singer, Michael Loring. TAC Records -- named for NYC's radical Theater Arts Committee – were produced by the Modern Record Co. (which was apparently affiliated with the Musicraft label that had issued many other cool tunes by the likes of Leadbelly & Harry "The Hipster" Gibson). As one measure of the TAC record's socio-political value, that bastion of Establishment sensibilities, Time magazine, bothered to take the time & space to diss the disc (which included "Abe Lincoln" on the A-side) as being "two crusty proletarian items" in a tacky March 6, 1939 review.